I monitor right hand drive news via google alerts, and an interesting article keeps popping up. Apparently rural mail carriers don't have RHDs.... I see them all over the city (and they're really really cute, as you can see [source]). I can say, that only makes sense. Apparently postal carriers aren't allowed to get out of the vehicle to deliver the mail.... so..... yeah... RHD makes total sense for them. 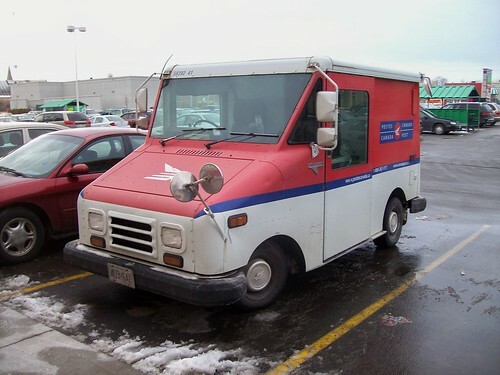 I know that the states uses RHD Jeeps for rural mail carriers (Postal Pete says so). I know that a 'postal carrier' is a good loophole to allow any year of RHD vehicle into the states. Now, they just need to justify Skylines and the like as postal vehicles and they're golden! The reason this piques my attention is that Canadian right hand drivers can use this as an argument if/when Canada tries to take away our cars. If they state they're 'unsafe' our argument is that if they are unsafe for us, they are unsafe for their employees who use them on a daily basis. Hopefully we never have to use that, but, we've got to create arguments now in case the day ever comes.